I’ve been scouring the internet looking for a solution to an MDX query problem. Common business practice would dictate that a hierarchy is more commonly used in pieces, most likely descendants of a specified member(s). This requires some sort of filtering mechanism. SUBCUBE and SUB SELECTS would be an obvious choice if it weren’t for the fact that they always return all members above and below the selected member(s). That kind of defeats the purpose of the filter. This MDX will demonstrate the point. If you toggle SELF to SELF_AND_AFTER the results do not change even though SELF eliminates the descendants. What is the best way to filter a parent/child hierarchy in this circumstance? They return different numbers of rows. The reason is due to the nature of what your query is doing. In the first query we’re finding all female employees. Which includes female employees and female bosses. (‘SELF’ prevents the query from returning subordinates of the female bosses, so the DESCENDANTS function is irrelevant here). The second query is finding all descendants of all female employees. This includes female employees, female bosses, as well as all descendants (male or female) for all female bosses. In a parent/child hierarchy the values of children are included in the value of the parent. So the value of a female boss is the same whether or not you include her subordinates, unless you ask for the member’s DataMember, which specifically excludes the child values from the aggregation. There are countless ways of writing descendants, filters, etc. for parent/child dimensions. If you let me know exactly what query results you’re trying to get then I can put together a query for you. The point is on filtering or limiting the Employees parent child hierarchy. You’ve moved the DESCENDANT function to the ROW axis which eliminates the filtering problem I am explaining, but also changes the granularity of the ROW axis. 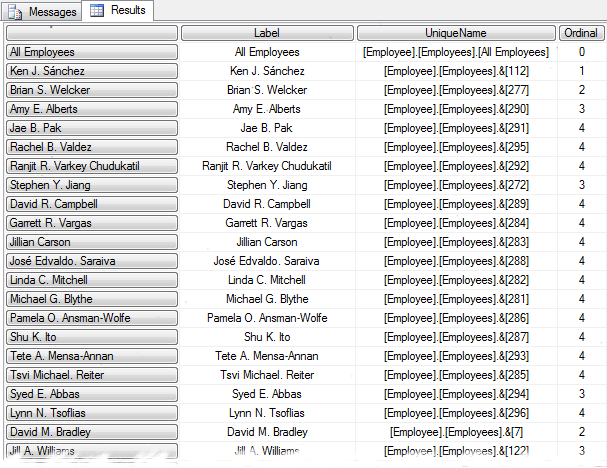 I want to use Employees hierarchy strictly as a filter, unfortunately executing it in a SUBCUBE or SUB SELECT causes the result to always include members above and below the selected members. If you toggle between SELF and SELF_AND_AFTER the results are the same. How would I predictably limit the members of Employees and use that set to evaluate across another attribute as my original example shows (Marital Status)? I need the option of parametizing between SELF and SELF_AND_AFTER. Unfortunately, the sub select behavior invalidates the DESCENDANT using SELF. Yes I changed the nature of the query in order to explain what your queries were doing behind the scenes. You said they were doing the same thing, which is incorrect. They are doing different things albeit with the same results. Working with any MDX it’s vital to have a clear understanding of what the filtering and functions are doing in order to diagnose any query problems. The problem in your example is not that the subselect is invalidating the descendents, it’s that the value for each parent includes the values of all children. Therefore when you’re aggregating the results it makes no difference whether the children are there or not, so the difference between SELF and SELF_AND_AFTER is totally meaningless in your example, and so you shouldn’t be parameriterizing it in the first place! 2) Don’t use the hierarchy. Just use [Employee]. [Employee].MEMBERS instead of the [Employee]. [Employees] hierarchy. Then each employee will be treated individually. Use the first option when you want to retain filtering on the hierarchy, use the 2nd when you don’t. To get the value of the datamember, just use ([Measures]. [Sales Amount Quota], [Employee]. [Employees].DATAMEMBER) instead of [Measures]. [Sales Amount Quota]. To make this work you can’t use a subselect, so you need to restructure the query somewhat. Be careful though when using DESCENDANTS on top of a filter statement, you run the risk of double counting values. e.g. a female employee will be counted twice if she has a female boss. This is because both women will be returned from the filter, therefore descendants will operate on them both. So you should use the DISTINCT function to protect against this. The Member_Key we can get by the method suggested in the post, but when we get the Member_Key, Id as Measures/members then performance is very slow. Is there any way i can get the Member_key in a set in rows section. while fetching data from SSAS cubed (in MDX format) in datazen only measure values are fetching not dimension values..??? please help me finding the reason and solving it….!!!! Hi there Alex, this question is unrelated to this post however I just want to ask anyway. I have struggled with the impact of my new Date Tool Util Dimension. I found after releasing that the users are no longer able to use Excel’s built-in everything. While I have worked around the sorting, I am stumped with the lack of filtering. My first effort was creating a dynamic set for the Top/Bottom 20 (based on the Prior YTD Diff) that gave me the correct results but restricted the ability to “Show on Report” the related attributes, so I add the attribute as a hierarchy column which causes unwanted subtotal rows which cannot be removed. Users are stuck viewing a single piece of the Dimension w/o causing the undesired results. I thought someone in google land would have an answer but I haven’t found it. I am probably too green to know the right phrase to search. What would be ideal at this point is somehow using axis() to dynamically apply TOP/BOTTOM n to whatever is currently selected in the pivottable. (Or any other suggestion that would allow filtering on these “ghost” dimension members. Thanks in advance, your articles have streamlined my efforts in so many areas. I am new to MDX. I have a cube with few dimensions. Report Date and Account are two of them. One account id may come under multiple Report dates. I need to find minimum report date for every accountid. ie the minimum date for every Accountid. Any ideas? I really do appreciate the help. How can I filter/search by the name of the member and not its ID. I need a simple way to replace ID “1002” (that can vary in a different environment) to the string “Apple” – meaning, instead of writing “1002” I will write “Apple”. You’re trying to run two queries in the same batch, try running one at a time and see if it works. I am running the below query i am getting error :Server: The operation has been cancelled because there is not enough memory available for the application. If using a 32-bit version of the product, consider upgrading to the 64-bit version or increasing the amount of memory available on the machine. I’m not surprised that you’re getting an out of memory error, this is a crazy MDX query to try and run. You’re cross joining 52 attributes together. Assuming that each only has 10 possible values (which I expect is a huge under-estimate) then you’re asking to the cube to create a dataset containing 10^52 values, which is approximately the same as the number of atoms in the Sun. In your query, it will only try and filter out the non empty values after it’s done this cross joining. If you want a data dump like this, you’re better off using T-SQL not MDX. MDX is for aggregated pivot style queries not data dumps. There are ways around this in MDX, by only bringing (cross joining) out the key from each dimension, and then returning member properties to get the remaining attribute values, but I would still question the validity of what you’re trying to do. am having one scenario i dont know how to achieve this scenario . in mdx i want like comma separated value.this mdx query i need to use in ssrs report. I’m not aware of any way to achieve that in MDX I’m afraid. You may be able to do it using T-SQL PIVOT or FOR XMLPATH, or using SSRS functionality. Im trying to run the below query but I keep getting hit with the Error (1030753): Memory allocation failed – output grid too large error message. Its when I take the clients down to level 2 that this error occurs, with clients at level 1 it works fine however problem is I only get client names at level 2, at level 1 its just client categories so this is unhelpful. Any assistance would be much appreciated? An alternative would be just to load data for specific clients – could anybody advise how I would adapt the query to just load the specific clients im interested in? And hopefully it should work for you. Thanks for your attention to making available these great mdx materials. I’m stuck trying to figure it out how to create a measure in Pivot Table Excel, bond to SSAS Cube. How may I adjust this query in order to get the right result to “grand total and subtotal?